Keith LaMotte plays his farewell show with the Spokane Jazz Orchestra on Saturday. After more than 40 years with the Spokane Jazz Orchestra, founding member Keith LaMotte is hanging up his trumpet. The 80-year-old will play his final concert with the SJO this Saturday, a decision he is happy to make. "This gives me the chance to go out on my own terms," LaMotte says. LaMotte and his wife first came up to Spokane from Southern California in the fall of 1974 after his mother-in-law won a trip to Expo 74. Impressed by what they saw, he put in for transfer at IBM to move up to the Inland Northwest. 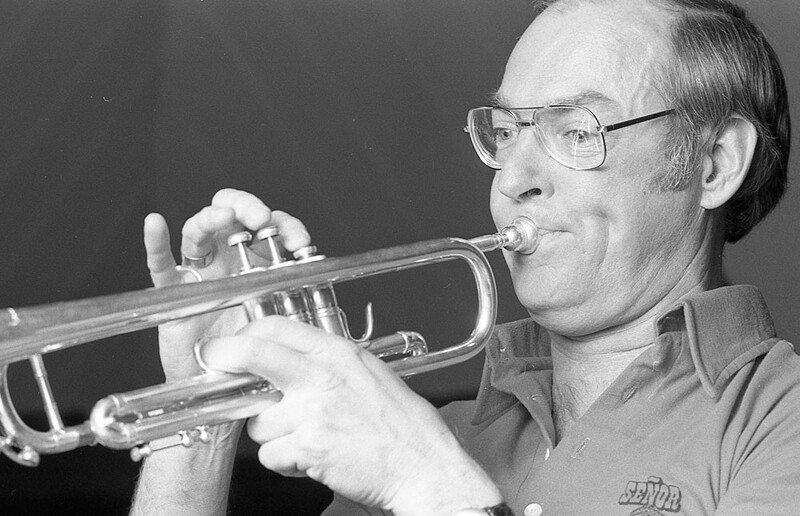 Upon arrival in the spring of 1975, he began attending the Spokane Jazz Clinic, which soon after became the SJO. "And there was this big band rehearsing with all these people, these guys, who became some of my best friends and I started rehearsing with that band," LaMotte says. "Things came together in that spring of 1975 with enough energy and vision that the idea of actually forming a performing regular rehearsal band with a conductor, a director, all sort of unfolded in 90 days in 1975." Jazz has long been a part of LaMotte's life. He began playing the trumpet when he was 9 and played in small bands until high school. Along with some other musicians at his high school, he formed a big band and played at school dances and other events. "That was my first experience with a big band and it never ended. From that day in 1955, I've been in a big band some place. L.A., Orange County, San Francisco area." Reflecting back on his career with the SJO, one concert in particular sticks out. May 20, 1980, the day of the Dizzy Gillespie concert, but also the Mount St. Helens eruption. Unaware of whether the concert would still happen, the SJO continued to rehearse as it became dark as night in the middle of the day. "When he came back to do the concert several months later, he came out on stage wearing one of those funny masks that you see in hospitals," LaMotte says with a chuckle. For his last concert, the theme is Christmas music, but one song will not be a holiday tune. Offered a solo for his farewell performance, LaMotte chose "Portrait of a Count," a composition from the Stan Kenton Orchestra in 1952. His dad took him to a Stan Kenton concert around 1952-53, he later played in the Kenton orchestra in the '60s, and this song was played. "That tune has been riveted in my mind for 60, 70 years." This concert is special for another reason as well. This past year his grandson, Michael Gerety joined the SJO as a guitarist. "I'm just really really glad that we get to share some of this time together because my grandpa's just a really joy-filled guy and he really cares about and loves the community of musicians here in town," Gerety says. With just saxophone and drums, Brooklyn's Moon Hooch will make you wanna dance. Or else.